Yesterday we discovered Battlefield 1's pigeon mission, today a tiny little pistol joins the ranks of Battlefield 1's weapons. Best of all this isn't a comedy shooter for the sake of it, it's a 2.7mm Kolibri Car Pistol - a real gun made by an Austrian watchmaker called Franz Pfannl in 1914. 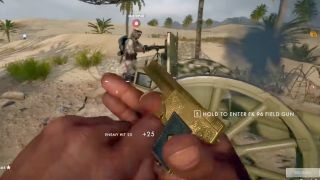 Clearly Battlefield 1's upped its stats in the game as the gun was reportedly very inaccurate, hard to load (because it's tiny) and had 0.2g bullets that were only capable of penetrating 10-40mm. As reddit suggests, it has to be a troll weapon.